Nice vintage Taylor smith dinner ware set called Ever yours, weathervane. 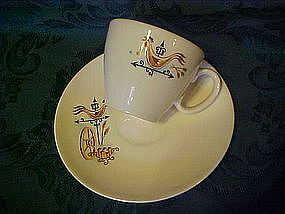 Pretty country pattern of a rooster weathervane on the cup and saucer. Cup has a soft warm cocoa color interior. Price is for 1 cup with it's matching saucer. I have 6 sets available. all are in perfect condition.